On May 12, 2008 strong earthquakes of 7.9 magnitude struck Sichuan Province of China, which caused ninety thousands of death and wounded about a quarter million people. Dr. Xu led China’s wound experts to the disaster zones and personally supervised treatment of many wounded victims by using MEBO’s regeneration therapy in conjunction with MEBO wound ointment and dressing. Shown in Figure 3.1.1 is a quake victim (age 36) with multiple open, deep wounds, especially in the right thigh that sustained a 25x20 cm2 wound injury with muscular necrosis and severe sciatic nerve damage. Three months later regeneration of hypodermal tissue under the condition provided by MEBO ointment resulted in significant restoration of structure and function of his leg, including sciatic nerves. The left foot of a nine year-old girl was severely injured during the May 12 earthquake with an open, infected wound (Figure 3.2.1). Dr. Xu supervised her treatment by using MEBO’s regeneration therapy coupled with negative pressure wound therapy provided by an Israeli medical rescue team volunteering in the quake zones. Under the condition provided by MEBO ointment, a skin flap was successfully engrafted to allow regenerative healing of her wound, thereby avoiding amputation of her leg. In this case, MEBO’s regeneration therapy and wound dressing was used to treat a earthquake victim with wound on her face and bone exposed (Figure 3.3.1). By applying MEBO wound dressing to her wound, the skin and underlying tissue were regenerated without leaving apparent scars on her face. 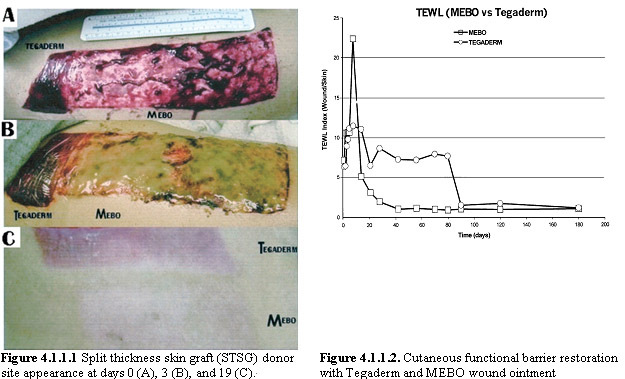 Clinical studies of the effects of MEBO wound ointment on the wounds of skin graft donor sites have been carried out to evaluate scar quality and physiologic barrier function restoration, as compared with Tegaderm, a semipermeable membrane occlusive dressing and with Sofra-Tulle, an antibiotic impregnated Vaseline gauze. Atiyeh et al. “”Scar quality and physiological barrier function restoration after moist and moist-exposed dressings of partial-thickness wounds” Dermatol Surg 2003 Jan; 29(1):14-20. Atiyeh BS, et al. “The effect of moist and moist-exposed dressings on healing and barrier function restoration of partial-thickness wounds” “ European Journal of Plastic Surgery 2003; 26(2): 5-11. 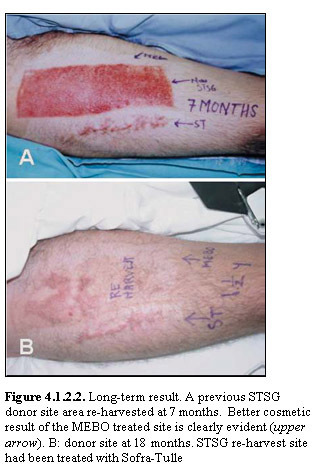 As shown in Figure 4.1.1.1, compared with Tegaderm application of MEBO wound ointment to split thickness skin graft (STSG) donor sites resulted in earlier anatomic healing with significantly superior cosmetic appearance of the resultant scars over 6 months of follow-up. Further, average functional barrier recovery time was 67.4±13.368 days for MEBO and 150±46.476 days for Tegaderm (Figure 4.1.1.2). 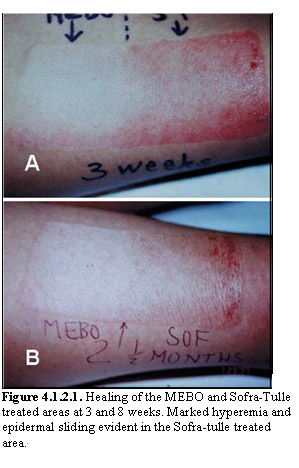 As shown in Figures 4.1.2.1 and 4.1.2.2, compared with Sofra-Tulle application of MEBO wound ointment to STSG donor sites on the same patient resulted in much faster reepithelialization (5-6 days vs. 10-12 days) and the MEBO-treated areas were markedly less hyperemic and less pigmented. All patients were more comfortable with MEBO most likely because of a rapid healing time hence a shorter painful period. In all patients there was lack of epidermal sliding in the MEBO treated area comparable to normal skin, in contrast to variable degrees of epidermal sliding in control areas. 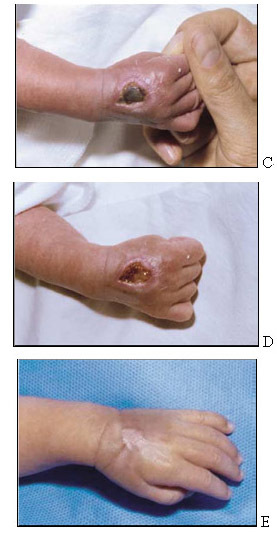 As shown in Figure 4.2.1, a wart on the face of this patient was surgically removed. The sutured wound was treated with MEBO wound ointment. Three weeks later the scar on his face was barely visible. MEBO wound ointment has also been used successfully to treat extravasation injury during parenteral hyperalimentation of infants, especially preterm infants. As described by Cho et al. 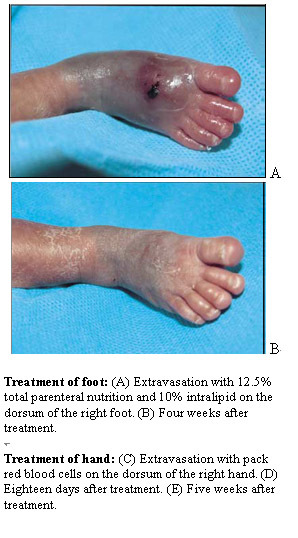 (2007) “Successful combined treatment with total parenteral nutrition fluid extravasation injuries in preterm infants” J Korean Med Sci 22: 588-94, five (5) premature infants with wounds of hyperalimentation fluid extravasation were treated with MEBO wound ointment in combination with an antibacterial ointment (Terramycin ophthalmic ointment). Table 4.3.1 summarizes the results of the treatment. As shown in Figures 4.3.2.1-5, wounds of these 5 patients had healed completely within about 1 month with a small size of contracture without functional abnormality. At 2 years follow-up, the wounds had healed completely without any sequel.